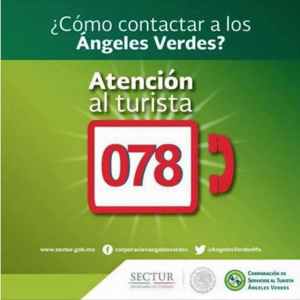 If you are taking a road trip through Mexico, whether by car or RV, one number you should keep handy is for the Green Angels. Call 078 from any cell phone or TELEMEX phone booth to ask for help and road-side assistance from the Green Angels. Radio dispatch will send a truck with bilingual mechanics to assist you. The Green Angels’ services are FREE. There is no charge for their service, just for parts, gas and oil if necessary. Tips, however, are appreciated. If you need assistance during the day and don’t have a phone, pull over to the side of the road and raise the hood of your vehicle. The Green Angels patrol the highways from dawn to dusk and will stop if they see that you need assistance. Mechanic assistance and emergency radio communication. Drivers carry gasoline and motor oil as well as spare tires and parts for minor but important repairs. Aid in case of accident. Trained in CPR, they can administer first aid in the event of an accident or medical emergency. Advice and information on the destinies (maps), services and tourist attractions of the state and regional. Federally funded initiatives like the Green Angels show the government’s commitment to tourist safety, security and well being and provide peace of mind to motorists driving on Mexico’s toll roads. For more information, see the Green Angels website or the Secretary of Transportation’s (SECTUR) website (both are only available in Spanish). If you are driving in Mexico, make sure that you have car insurance for Mexico, because U.S. and Canadian insurance policies are not recognized here. For a free online quote, visit Sanborn’s Insurance. If you have any questions about purchasing car insurance for Mexico, you can talk to insurance agent Julie Akin, who lives in both San Carlos Mexico and in Tucson Arizona.